This week’s French Fridays with Dorie challenge is for Spice-Crusted Tuna. We were lucky enough to find freshly caught Ahi on the Fresh Fish Fanatics boat at at the Farmers’ Market on Sunday. John sliced it into beautiful steaks, coated it in an aromatic blend of spices that included ginger, coriander, and cardamom, then pan-fried it in just a bit of olive oil. So simple & so delicious! We cook fresh fish quite often but this flavor combination had all of us wanting more. 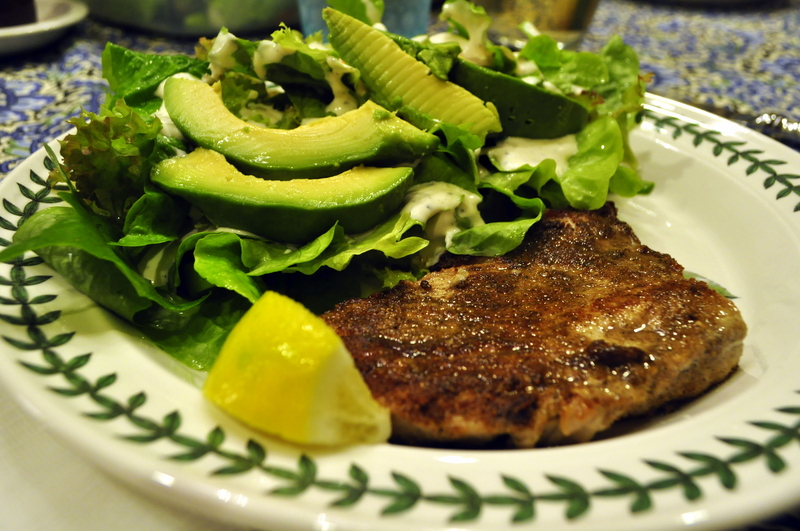 We served it with a simple salad made from lettuce right from our garden. The only thing that could have made it better would have been eating it at a Paris cafe. Our niece enjoyed the rest of the tuna and salad for lunch the next day and was the envy of her co-workers. It’s safe to say this is a new family favorite! A quick, easy, and delicious dish that’s perfect for company, or a quick weeknight meal. I agree, Susan, this is going to be a favorite at my house also. I don’t cook fish often but the past three weeks of recipes reminds me that I should. This flavor combination was a new one for me and very “un-tuna like” but I certainly enjoyed it. For a salad, I really don’t think you needed much else but those lovely greens from your garden and some avocado slices. Very nice. How wonderful to have found fresh fish. I really liked this one. This one was definitely easy and a winner for my Mr Neil! I’d make it again for company for sure! Fresh tuna and lettuce from your garden? Sounds like a heavenly dinner! Having access to fresh fish makes all the difference I think! We just didn’t love the spice combo. I’m questioning what’s wrong with us as I read through everyone else’s experience. We seem to be the only people who didn’t like it:( Yours looks great and I love that you have your own lettuce! Susan, We’re expecting a nor-easter tonight, and you’re picking lettuce from your garden… so jealous!! Your tuna looks fabulous, and perfectly cooked! Happy Friday! I am so envious of how wonderfully fresh your food always is in Califorina. Glad you enjoyed this one gorgeous looking. I served a butter lettuce salad with our tuna as well. It was delicious. Glad you enjoyed it! What a gorgeous plate of food! Glad you all enjoyed it. 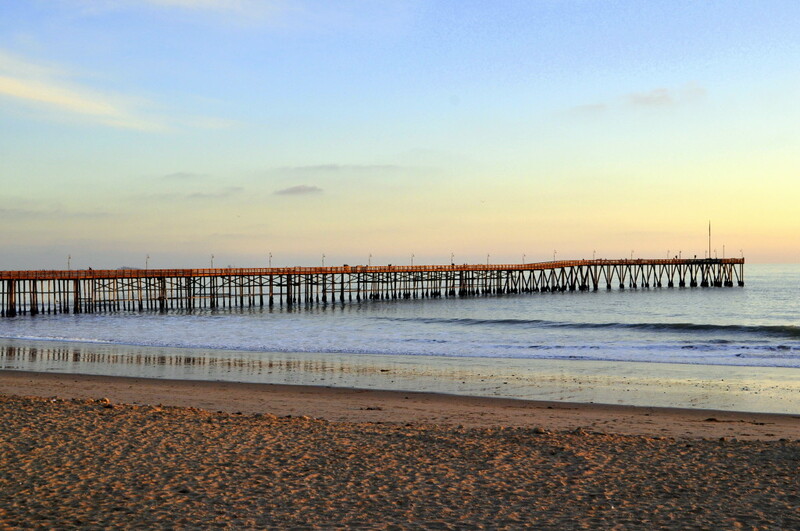 I also love the photo of the pier: we’ve been having some nice sunsets lately, right? Simple, delicious, and beautiful. And homegrown lettuce? It’s the best! That lettuce reminds me of summer, the whole recipe looks fabulous. Ok seriously, you are killing me. Fresh off the boat fish AND salad from your garden ?? In JANUARY ?? Good thing I like the mid Atlantic so darn much – LOL. Your plate looks fabulous (as does that pier shot….) and I can understand the coworkers envy your niece experienced. Great job ! Looking at a few inches of snow outside my window, the sound of lettuce fresh from the garden makes me jealous. I’m not surprised this will be a new family favorite. You always have such nice pictures of the local scenery. Wished I liked tuna but I don’t. I am having fun with my make-ups. I knew I was going to be jealous of your Fresh fish and produce! Looks lovely and I am sure it was as tasty as it looks. Love your homegrown salad ingredients! And this is also a keeper recipe in my house! I loved how easy this was, I agree the only thing that could have made it better would have been a Paris Café!